*PERFECTION ON THE PIER* Welcome to 7 Constellation Wharf, where the serenity of waterfront living perfectly complements your urban lifestyle. The dramatic panoramic views of the Boston skyline are a spectacular start & end to each day. Inside welcomes a stunning renovation, w/ floor to ceiling windows & the finest contemporary finishes & fixtures. The lavish Chefs Kitchen w/ marble counters, state of the art appliances & abundant high-end features is grand enough to facilitate comfortable daily living & seamless entertaining alike. 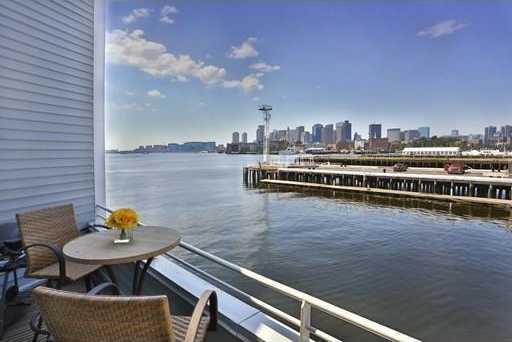 Watch boats gently sailing on the Harbor from your decks- the view will take your breath away. It is easy to live the high-life, with a master suite that romantically showcases the city skyline & includes custom closets & a luxurious oversized shower perfect for relaxing after a long day. Three levels of living space support 2/3 bedrooms & 3.5 baths. Sited at the water’s edge, this rare townhouse offering includes a private garage. What are you waiting for?